The new report on the state of climate change by the IPCC (Intergovernmental Panel on Climate Change) came out last Friday but leaked versions had already been circulating. Reuters was first to publish a story on the leaked document that was followed by several articles and, inevitably, a new wave of controversy fueled by skeptics. An interesting piece in The Guardian describes how several misleading stories with dubious sources were soon followed by corrections/clarifications. I gave an interview on this to Kyodo News Japan, and I also spoke briefly with IPCC Chair, Dr. Pachauri, during his Geneva visit to attend the General Assembly of Green Cross a few weeks ago. The IPCC was formed in 1988 to provide a clear scientific view on the current knowledge on climate change and its impacts. The IPCC has become THE authority on climate change and received the Nobel Peace Prize in 2007 (shared with Al Gore) for its work. Thousands of scientists and experts have contributed, as volunteers, to writing the reports, of which the policy-related sections are subject to word-by-word review by government representatives to reach consensus. Hence, one can understand that through “natural caution” and the complex process of peer review, scientists may be underestimating the pace, intensity, and consequences of climate change. Secondly, given that all member states can influence this process, what ends up being published is a watered-down version of the actual state of affairs. John Reilly, Co-director of the Climate Program at MIT, thinks the IPCC estimates are too conservative: the IPCC worst-case scenario is in the middle of MIT scientists’ estimates of likely outcomes. 1) We are more certain then ever that human activity is causing climate change – with a 95% confidence level versus 90% in 2007, 66% in 2001 and 50% in 1995. 2) The IPCC now expects warming of between 1.5 and 5°C by 2100 if we cannot rapidly reduce emissions. Still these figures appear conservative given that we are already at 0.8°C of warming above pre-industrial levels and there is another 0.6°C already programmed for the future due to past emissions, it seems prudent to prepare for higher warming then the 2°C that remains the target of the climate negotiations ahead of the Warsaw Climate Talks this November. 3) Arctic and Greenland ice are disappearing faster then previously expected. The Arctic is expected to be ice-free in the summer within 40 years – some scientists think even sooner. This will have important implications for countries like Canada and Russia. 4) Sea level rise is unequivocal. The IPCC has raised its estimate to a rise of 29 to 82 cm by 2100 (18 to 59 cm of the 2007 report) stating that sea levels will continue rising even if other climate systems can be stabilized. It is worth noting that Greenland and Antarctica contain enough ice to raise global sea levels by 66 meters – so whilst this process would take thousands of years, we know that sea levels can rise higher than the current predictions. 4) Ocean acidification is threatening coral reefs and degrading marine eco-systems that support 95% of life on the planet. This is a major area of concern – mean ocean acidity has already increased by 30% in the last 200 years – a rate 10 times faster then anything experienced in the last 65 million years. 5) Local impacts of climate change will be difficult to determine. This uncertainty at local level makes planning and preparedness more difficult – a serious risk factor for local communities and authorities. 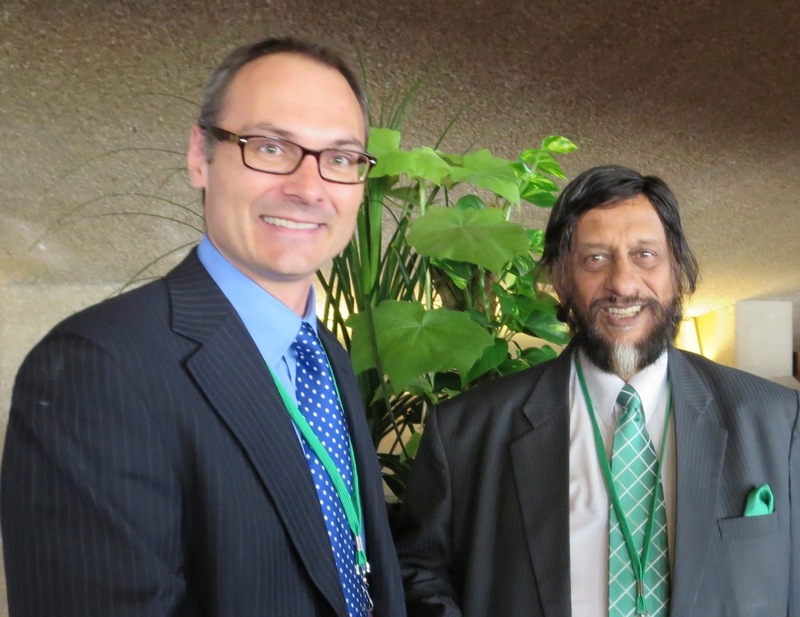 To illustrate the implications of this new report, Dr. Pachauri explained that a temperature rise of 1.5 to 2.5°C would result in 20% to 30% of species facing extinction and severe consequences for human health, agriculture, water availability, etc. Weather will be impacted with an intensification of extreme precipitation, even in places where average rainfall actually decreases. Heat waves will become more frequent and intense – what was expected once every 20 years will occur every 2 years. Dr. Pachauri quoting Mahatma Gandhi said: “we may utilize the gifts of nature just as we choose but in her books the debits are always equal to the credits”. “Humanity has completely ignored, disregarded and been indifferent to the debits. But today we have the knowledge to be able to map out the debits and to understand what we have done to the conditions for life on this planet”. Our reliance on flawed measures of progress like GDP has blinded us into thinking that we were achieving “progress” while in reality we have been degrading the “natural capital” on which humanity and life depends – and hence on which the economy rests. Through better “accounting” and better judgement we can correct these market failures and start building the clean and sustainable economies of the future.